$7 trillion in tax hikes and automatic spending cuts start to kick in on Jan. 1 if Congress does nothing. Further complication: The debt ceiling. NEW YORK (CNNMoney) -- House Speaker John Boehner has all but promised an ugly fight over the debt ceiling this year unless GOP demands for spending cuts are met. Sound familiar? The GOP took the same tact last year, leading eventually to an epic Washington fight that led to a first-ever U.S. credit downgrade and a major disruption in global markets. The difference between then and now, however, is that a destabalizing debt ceiling fight is just one in a line of self-created dilemmas facing lawmakers this year. That is, the fiscal cliff. So what is the fiscal cliff? The phrase was coined by Federal Reserve Chairman Ben Bernanke to describe the simultaneous onset of tax increases and spending cuts that will be triggered on Jan. 1 unless Congress acts. Combined the policies would take $7 trillion out of the economy over 10 years -- about $500 billion of which would occur in 2013. Such measures include the expiration of the Bush tax cuts, middle class protection from the Alternative Minimum Tax, and more than 50 "temporary" tax breaks for individuals and businesses that have been on the books for years. They also include nearly $1 trillion in blunt spending cuts across many areas of the federal budget. These include significant bites out of defense and non-defense spending. A number of stimulus measures -- such as the payroll tax cut and extended unemployment benefits -- will also be ending. What's the risk to the economy? Economists and the Congressional Budget Office predict the United States could cause a recession if the expiring tax cuts and impending spending cuts take effect all at once. On the other hand, simply extending the tax policies and canceling the spending cuts could add more than $7 trillion to the country's debt over 10 years. While that would boost growth in 2013, it would hurt the economy by the end of the decade. That's why fiscal experts hope lawmakers will take a more finessed approach to both supporting the economy and reducing deficits over time. Can't Ben Bernanke help? Not according to Ben Bernanke. On more than one occasion, the Fed chairman has all but begged lawmakers not to mess this one up. "[I]f no action were to be taken, the size of the fiscal cliff is such that there's I think absolutely no chance that the Federal Reserve ... could or would have any ability whatsoever to offset ... that effect on the economy," Bernanke said recently. So what's Congress going to do about it? Excellent question. Unfortunately there's no answer yet. Given that it's an election year, and the balance of power between the parties is up for grabs, many observers expect lawmakers won't even begin to address the fiscal cliff in earnest until after Nov. 6. Dealing with the fiscal policy pile-up in less than seven weeks will be a hot mess. Indeed, former Republican Sen. Alan Simpson is predicting the lame-duck session of Congress will be "chaos." One potential outcome: A package that extends some tax cuts and postpones some spending cuts, effectively punting the real debate to the new Congress in 2013. House Budget Chairman Paul Ryan, a leading Republican on fiscal policy, has said publicly that he would welcome that outcome if it were proposed by President Obama. And a temporary package to buy time also seems to be the default expectation among many on Capitol Hill. The terms of that package could very well be determined in tandem with the debate over raising the debt ceiling, which will make things messier still. 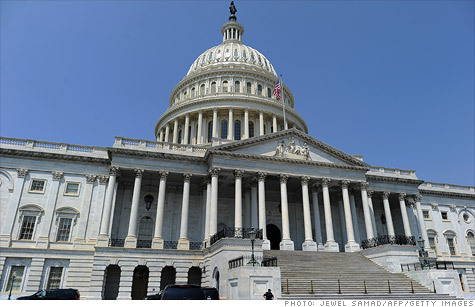 What's at stake in a debt ceiling showdown? When and how the debt ceiling is raised will matter. Last year, the fight was ugly and protracted. The end result: a first-ever downgrade of the U.S. credit rating by Standard & Poor's, which cited political brinksmanship as the chief cause, and one of the most volatile weeks in recent history for world stock markets. There's no reason to believe this year would be any different if the fight again becomes ugly and protracted, especially since it may get tangled up with the fiscal cliff debate, which will also weigh on investors and credit rating agencies.